“This year’s victory is even more beautiful than the previous one I think. The first victory of the Eneco Tour was a bit unexpected, but to perform on a same level this year was much harder." The Eneco Tour finished today with a little Tour of Flanders. From Sint-Pieters-Leeuw to Geraardsbergen, the peloton had to cover 188.6 kilometres and had to tackle eighteen climbs, including some famous names lie the Berendries, Leberg and Kanarieberg. The finish line was on the legendary Muur van Geraardsbergen. It promised to be an exciting battle for the stage win and it turned out to be so. Three riders from the breakaway stayed in front and they fought for the win. Quinziato was the best, just ahead of Leukemans and Lampaert. Tim Wellens and Lotto Soudal defended the leader’s jersey very well, Wellens obtains his second overall victory in a row in the Eneco Tour. He had 59 seconds of advantage on Van Avermaet and 1’17” on Kelderman. Wellens and André Greipel won a stage, the red points jersey of the Gorilla wasn’t threatened. Tiesj Benoot obtained a few nice places and finished eighth in the GC. This week may be considered as a real success and the team is going home with a fantastic feeling. 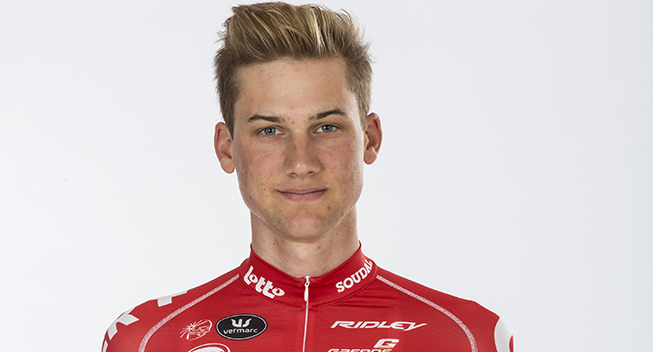 Tim Wellens reviews the wonderful performances of Lotto Soudal in this year’s Eneco Tour. “It’s very nice to win the Eneco Tour of course," he said. "And not because the Tour de France wasn’t as good as expected. It’s just fantastic to win a one-week stage race, it pleases me a lot. "I started in this race with some doubts, because I didn’t know how I would feel after the Tour. After the time trial I really had a good feeling and I knew for sure that the condition was good. "The question was; how is Tim going to perform after the Tour? Well, the last days in that Tour I felt that my shape was improving, the choice to ride in the Clasicá San Sebastián appeared to be a good one. This week I confirmed this better shape. “This year’s victory is even more beautiful than the previous one I think. The first victory of the Eneco Tour was a bit unexpected, but to perform on a same level this year was much harder. "Beforehand, I considered Greg Van Avermaet and Philippe Gilbert as the most importants riders for the overall victory, they were really in a good shape. But yesterday I made the difference because I did a recon of that stage. That Côte de Saint-Roche appeared to be a key point and I was glad that I’d done the recon. “I have no other choice than to thank the teammates for their work the previous days, they really did an a-ma-zing job. Everyone supported me very well. Greg Henderson, Marcel Sieberg and Stig Broeckx did a lot of work in the beginning of the stages. Afterwards Jens Debusschere, André Greipel and Tiesj Benoot did their work and they did it fantastic. I’m really thankful. “After this Eneco Tour I know that I don’t have to aim on a good classification in the Grand Tours. The one-week stage races without the high mountains like Paris-Nice and Tirreno-Adriatico fit me more. "For the rest of the season, I hope to maintain the good shape as good as possible. Normally I won’t ride in Hamburg, but I will start in Plouay. After that I’m going to Canada for the races in Quebec and Montreal and to prepare myself for the World Championships Team Time Trial.